Couscous Café is the perfect place to spend an exotic evening whether its with your partner or family and friends. The restaurant is cosy with a warm, lovely atmosphere. It’s an intimate little spot, with colorful and tasteful decor; lots of exotic furnishings - coloured glass and gilt lanterns and lots of gorgeous carpets, cushions and original furnishings all in true authentic Moroccan style. You can’t help but tap your feet to the fantastic African music that only adds to the unique atmosphere. Serving high quality Moroccan dishes, Couscous has received favourable reviews from almost every publication, including Time Out, TNT, Metro and a number of tourist guides both inside and outside the UK. A huge achievement for a small Bayswater restaurant. This is a very popular restaurant and advanced bookings are highly recommended. Dishes here are excellently cooked and beautifully presented. There is a carefully constructed selection of wines to accompany your meal. To finish off, you can order your dessert without feeling guilty, as most desserts are prepared with fresh and dry fruits, honey and nuts. Service is personal and the staff know the intricacies of each dish and is more than willing to explain its origins. The environment is small and friendly with other customers happy to share their experience with you and telling you what you should try next. It is then not surprising that CousCous caf� has been the meeting point for two lucky pairs who later got married. Moroccan cooking is characterized by rich spices. 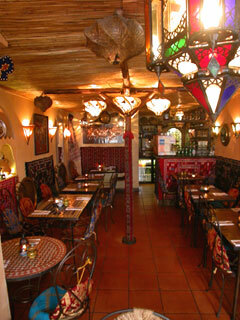 There is a good choice of wonderfully appetising tagines, slowly cooked the traditional way. Mezze - a mix of two vegetarian dishes, sliced lamb with figs, almonds, shrimps and vermicelli, are popular as well as a selection of authentic Moroccan pastries. Try the Royal Couscous or Kefta - spicy lamb meatballs and finish off with Beghrir (berber pancakes served with honey, figs and almonds) or simply a glass of their refreshing mint tea.